This is a lightweight flogger. Domina feels that the purpose of a flogger is generally to cause various sensations. 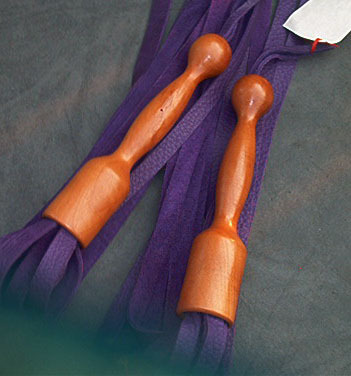 We build our floggers so that the qualities of the leather are paramount. So a lighter weight flogger like this will showcase the bullhide leather. A big mop just showcases thud. Not that there is anything wrong with thud. If that is your aim, then have at it. Everyone is different and what makes you happy isn't always the same that is going to make someone else feel the same. This is also a pretty piece as well as a useful one. And because it's not a mop, there will be some surprising sting wrapped into the thud that bullhide produces.